The Gefen EXT-DVI-141SBP is a DVI Super Booster Plus that allows the extension of HD digital video over copper DVI cable well beyond its specified 15-foot distance. Without such a device, sparkles or other objectionable mutations of the video signal can appear that indicate the signal has been degraded. The DVI Super Booster Plus uses a plug-in power supply which helps to extend sparkling clear video of up to 1080p or 1920x1200 resolution at a maximum distance of 200 feet. 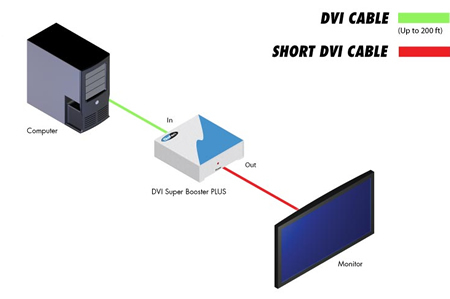 Simply place the DVI Super Booster Plus at the end of your cable, then connect your monitor's cable to the DVI Super Booster Plus. Make sure all video cables are connected properly at the source and destination ends. Attach the power cable to the DVI Super Booster Plus. Power up all equipment. You will now see flawless video at your remote display as if you were sitting directly in front of a local HDTV monitor. Note: The DVI Super Booster Plus is HDCP pass-through.